One of the accounting department's responsibilities is the cheques management. In order to appropriately manage and organize the cheques of the organization, the accounting manager should follow each cheque and to create records for the cheques transactions: deposit cheques, report bounced / replaced cheques, postpone cheques. This tab is used for managing the organizations cheques. Filter Fields - Use these fields to define the required filters for the report. Results Table - This table displays the cheques, according to the defined filters. The action buttons in this window allows to update the status of the cheques, as described below. From Date / Till Date Choose the required time-frame of the cheques origin production time. From / Till Total Amount Define the Total Amount frame of the required cheques. Currency Select the currency of the required cheques. Handling Status Select the status of the required cheques from the list. Agency Choose whether to display the cheques from all of the agencies or from specific agency. Drawer / Station ID Choose the drawer / station ID of the required cheque. Client Full Name / Number Fill in the details of a client to display the list of his cheques. Receipt Number Find a cheque according to its produced receipt number. Bank / Account details Display cheques according to required bank / account. Cheque/CC Number Find and display a cheque's details according to its number. This table displays all of the cheques according to the defined filters. 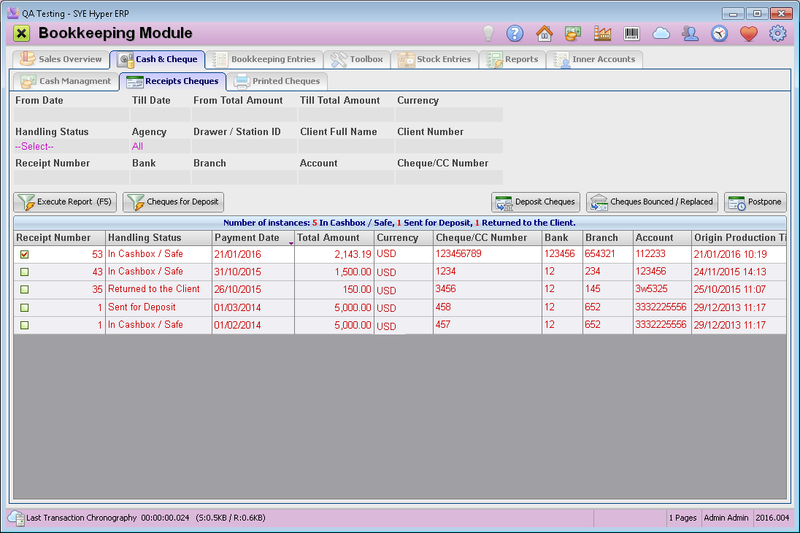 By using the Cheques for Deposit button, the table displays the cheques for deposit. Double click on a cheque's record to open its client card. The title of the table presents the number of instances according to the handling status of the cheques. Cheques for Deposit This button will display all of the cheques for deposit. Please note, the table will also display the cheques for deposit on the following day (or after the weekend). Cheques Bounced / Replaced This button is available for cheques with a handling status of "Sent for Deposit". Use this button to report a cheque that was bounced or replaced. This button will also create a document that reports this action of the user. Please note - use this button in case of mistake, when the cheque was marked as "Sent for Deposit" but is still in the cash box / safe. This action will change the handling status back to "In Cash-box / Safe". Postpone This button is available for cheques with handling status of "In Cash-box / Safe" and is used for updating the deposit date. In the "Postpone" window, select the required postponed deposit date and press the OK (F6) button. The handling status of this cheque will be changed to "Deposit Postponed". In order to deposit cheques, the Inner accounts of the organization should be defined in the "Inner Accounts" tab of the Bookkeeping module.